JackPot | West Coast Micro Greens Inc. Grow like us! Traditional container growing has numerous inherent problems, especially circling roots, splitting containers, tree blow-overs and high root zone temperatures. The severity of this root-circling problem was dramatically demonstrated during Florida’s Hurricane Andrew in August 1992. Many of the trees blown over in the hurricane showed evidence of never having outgrown the root-circling pattern they established when grown in conventional plastic nursery containers. Because of this, the trees were never able to properly anchor themselves when planted. Hurricane Andrew showed how serious this root-circling problem could be and the importance of finding a container production method that was practical and cost-effective, that provided air-root pruning to prevent spiraling roots. Made from a sturdy fabric called non-woven polypropylene, this product, commonly used in civil engineering projects, has tremendous burst strength and porosity, and allows air flow over its entire surface, moderating soil temperatures for cooler root zones. With the help of textile engineers, creator Jack Miller tested many generations of this new fabric container in the field. The result was the JackPot, a fabric air-root-pruning container that is rigid and easy to use with a high UV protection requirement, with an excellent service life of three to five or more years (depending on fabric weight), even in the extremes of Florida sun. The container was named JackPot to demonstrate the pay-off growers receive when using this product to overcome the risks of the agricultural business. Click here to see why the JackPot excels in air root pruning! See how JackPot above ground grown trees perform in extreme cold in Europe. The JackPot costs less than all other containers on the market, provides air-root pruning and moderated root zone temperatures, is extremely sturdy and durable, allows for root tack-down and prevents wind blow-overs, and greatly reduces the amount of storage space needed for containers. In the early days of JackPot use, customers who purchased trees grown in the JackPot quickly began to realize the advantages of the container, and began purchasing it as well. One customer purchased 75,000 containers for exclusive use in a new 150-acre container tree nursery. At the Great Southern Tree Conference, a University of Florida test results revealed that JackPots excel in the production of superior root systems in trees. See the full report! Edible landscapes are an attractive way to produce fruits and vegetables for commercial or home use. You can create a fully automated urban farm or incorporate simple elements into your existing yard or garden. By growing vegetables, herbs, fruit trees, and berries in a JackPot air pruning container, you will find immediate rewards by saving time and money while enjoying the benefits of food from your own landscape. 200 gallon JackPots make an ideal patio or balcony garden that can be emptied and moved in an instant. Grow herbs, greens and other vegetables within feet from your kitchen! 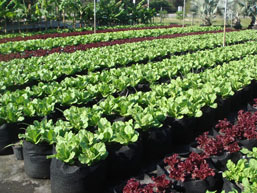 JackPot aeration containers are simply the best method of growing above-ground. Results continue to astound our customers as they discover the many advantages to our patented containers. Garden plan, shown below left: JackPots are a main component in the future trend of localized food production, large and small, as shown in this plan for Ft. Lauderdale Vegetables, LLC. JackPots provide moderated root zone temperatures, dramatically improved drainage through the entire container, and aeration to the soil due to excellent air flow through the fabric. This air flow improves air root pruning, creating masses of fine feeder roots which accelerate plant growth and minimize disease. Gardening in JackPots greatly reduces your time and labour. No more tilling, digging, weeding and planting for hours — it is simply not necessary. Incredibly outgrow conventional gardeners! Grow faster, larger and better-tasting produce than the earth-bound competition. Now you can grow healthy, robust vegetables including delicious heirloom tomatoes, amazing celery and carrots, and much more. Everything grows better in a JackPot! It’s easy to improve your container soil in a JackPot — simply add your amendments to the first several inches of soil and allow gravity to provide nutrient rich leachate for many months during your growing seasons. Organic growing has never been this simple! Of course if it is necessary, JackPots can easily be moved to take advantage of ideal light conditions as the season changes. 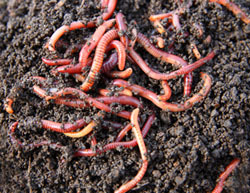 Vermiposting is a process of composting with worms that will save you time, effort, and a tremendous amount of money. Our 100-gallon JackPots have become the leading vermiposting container in many gardens. Many gardeners compost to keep biodegradable wastes out of landfills and to create a rich, organic matter that can be returned to the soil. Adding worms to your composting efforts will speed up the composting process and even enable you to continue composting in the winter, when most outdoor compost piles (at least in northern climates) are useless in a frozen state. Compost that has been created by vermiposting will be richer in the vital nutrients your plants need. Our 100- and 200-gallon JackPot Vermiposters are simply the best method for composting with worms. When the amount of compost in the bin is reduced and has an earthy, brown appearance, it is ready to use. This process usually takes about three or four months if you have chopped the waste into small pieces, and perhaps six to seven months if you’ve added it whole. Oxygen is necessary for decomposition, and the worms absorb necessary oxygen through their membranes. Unlike conventional vermiposting, our JackPots will aerate the compost without the need to mix, stir or turn. Simply put, you will not find a more cost-effective and productive container for vermiposting than the JackPot. Unlike other container manufacturers, the JackPot can be custom-sized to any size and capacity you require. Minimum order required. Call 1 (250) 885-4892 for details, pricing and ordering. JackPots are the original and only patented air-pruning fabric container and are patented under U.S. Patent #6,612,072. This patent is knowingly and blatantly being infringed upon by others in the marketplace, but due to the astronomical cost of defending our patent, we are unable to. The consumer, however, should know the reality and the facts, and as such now have the option to either reward others for their infringement / theft, or reward us with their business for our innovation. Please click to read the patent.